Paddle Palace respects your privacy and is committed to protect any personal information you share with us. We do not sell, rent, or give personal customer information to any other company. The only exception is the circumstance when we sent the information to our business partners who work on our behalf to fill your order, for example when we drop-ship a table to you directly from the manufacturer. In this case, we will provide to our partner ony the information required to deliver the service or product, and they are prohibited from using that information for any other purpose. Other than this, we will disclose your personal information only if required to do so by law, or to protect personal or public safety. Any special pricing offered for an item will show on the item description screen, and it will show in your shopping cart. Join Our Email List to receive notifications of Special Offers, News, and Product Info. Mobile devices do not have the PayPal option. 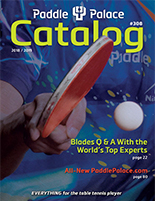 You can mail an order with your check or money order payable to Paddle Palace. For your convenience, you can order using the shopping cart, then before checking out, print the screen to mail with check or money order. *For shipments shipped to USA, there are no charges for tax. *For orders shipped outside of USA, the customer is solely responsible for paying any duty or tax imposed by your government. Paddle Palace does not collect from you or pay on your behalf international taxes. * Items returned for refund or exchange must be new and unused, and in the original packaging. Returns and exchanges must be made within thirty days of purchase. * No returns accepted for Custom-Made Paddles. When you request Paddle Palace to cut and apply rubber, the blade and rubber is not eligible for a return or exchange. * All CD’s, DVD’s, and videos are non-returnable and non-refundable unless found to be factory defective. * We do not accept a return or exchange for shoes or clothing which show any evidence of wear. * If a return is necessary, send the item to: Paddle Palace, 12230 SW Main St., Portland, OR 97223, USA. On a note inside the package include your name, address, phone number and contact info, reason for the return, original invoice#, and action expected of Paddle Palace.